LOS ANGELES (AP) — Two early surprises to the NBA season met Friday and regulation wasn’t enough to settle things. Memphis’ Marc Gasol, who did not score until the 4:50 mark of the second quarter, led all scorers with 27 points, to go with his 13 rebounds. Rookie Jaren Jackson Jr. added 20 points and Mike Conley 19 for the Grizzlies. Conley fouled out with 2:51 to play in regulation. Memphis coach J.B. Bickerstaff called the sixth foul a “joke” and wasn’t thrilled with several of the calls that went against the Grizzlies, who have one of the league’s best defenses. “Our defense is where we live,” Bickerstaff said. “It’s frustrating when we are not allowed to defend the way that we are. That’s our reputation and it’s frustrating. 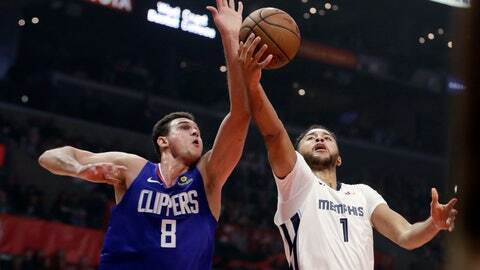 The loss snapped the Grizzlies’ five-game winning streak and left them and the Clippers at 12-6, temporarily tied with the Portland Trail Blazers for first in the Western Conference. Portland was scheduled to play later Friday. The Grizzlies trailed 110-107 with 18.7 seconds left in overtime and had the ball, when guard Avery Bradley stripped it from Memphis’ Garrett Temple. “The key to this team —the key to this league — is when you have your name called, be prepared for every situation,” Bradley said. Conley leads the Grizzlies in scoring (20.2 points) and assists (6.0), but they had to play the game’s final 7:51 without him after he fouled out.